This is one of the first wildflowers I learned the name of when I was a very young child. The name was compelling and Eastern North Carolina had a large Diamond Back population that, as children playing in he yard, we were warned almost daily to watch out for. I even had a few close calls with rattlesnakes. So, the plant was easy to remember. 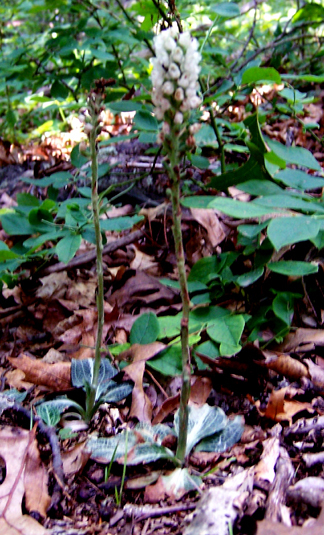 The Latin botanical name is Goodyera pubescens and the Family is Orchidaceae. It is in the orchid family. It loves pine wood floors and I have rarely seen the stalk reach a height of one foot. It has a large range in the Eastern United States and into some midwestern areas. My photo is not the best but I haven’t seen this plant in flower for years and had to post my sorry attempt at photographing it.